Brisbane Apartment: New or Resale? I am often asked whether it is better to buy a new or resale apartment? A new apartment can be unsold developer stock in a new building or an off-the-plan apartment for a building not yet built. A resale is a sale from someone other than the original developer. 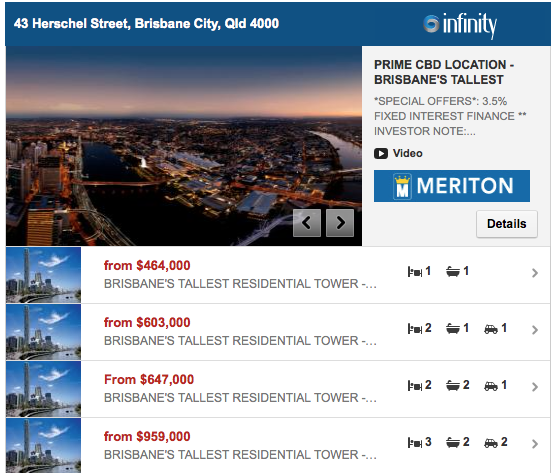 There is a price difference between a new and resale apartment in Brisbane. Sometimes, this is because a new apartment is new, with no wear and tear (e.g., freshly painted, new carpet, new kitchen, new appliances, etc). But often, the price difference is not explained by newness. Sometimes, the price difference is due to developer profit and marketing costs. For example, Sunland is currently marketing Abian. A large number of people I know have received a fancy brochure mailed to them, unsolicited, by Sunland. There is an expensive display office onsite in Alice Street, where the landscaping alone would have cost a small fortune. There is a video of a lost rich girl wandering around Brisbane, that does a good job not showing the neighbouring Quay West building. Buyers are paying for all these marketing costs, plus the developers profits. Another example is Infinity, by Meriton. 2 bedrooms, 2 bathrooms, 89 sqm in total, no balcony, 7 apartments per floor, short stay and hotel guests, for $647,000 and up! Or you can buy an apartment in Metro 21, on level 25, with river views, a large balcony, 2 bedrooms, 3 bathrooms, 113 sqm total floor area, 4 apartments per floor, no short term rentals or hotel guests. For a price less than a Meriton apartment. Metro 21 is a boutique residential building, with good facility, and a low ratio of residents to facilities. Seems like an obvious decision to me. That is $7,269 per sqm compared with less than $5,700 per sqm. Jeff, a seller of a resale apartment also needs to pay for marketing and often this cost is quite high as well. I think the differences can therefore be explained by economies of scale. A typical auction campaign for a single apartment would cost about $25,000. Apply the same budget to Sunland and their 147 apartments and you get a total kitty of $3.7M... more than enough to pay for fancy TV ads, a nice brochure and a swish display suite.